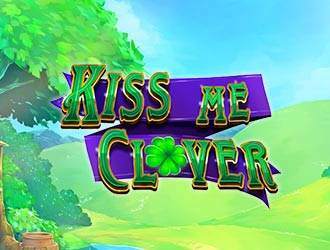 An Irish themed slot game awaits you here at the Kiss me Clover slot game. The game has been designed by Eyecon and you can try it on all your favourite devices- tablets, phones and desktops. Try it out today at Cloud Casino to experience a wonderful slot playing experience. With 5 reels and 25 paylines, the experience of this game is pretty amazing. For the background of the slot, there is a blue sky, a small lake, lush green valleys and some mountains. While playing, the game displays a peaceful setting accompanied by soothing sounds in order to make you feel relaxed while playing the game. For the reels that you will find here, there are wooden reels and 4 leaves clover which are surrounding the woods. To be able to start, you need to set the bet in the game. This bet should start from a minimum value of £0.01 and the maximum amount of bet that can be set here is £12.50. The selection of the bet amount can be made using the arrows. For winning higher payouts, the stake should be higher. A payline needs to be chosen from one to twenty-five. An Autoplay button option can be picked wherein the number of spins will range between 10, 20, 50, or 100. The symbols that can be found here should be aligned as 5. For the symbols that you will find here include the green hat, the golden clover, the mushroom, golden coins pot, the Ace, the King, the Queen, the Jack, Ten, and Nine. This is a pretty amazing feature that has been brought to you by Eyecon studios and you can test your luck here. There are 2 options that you will be needing to choose from. The winning amount here is either double or nothing. You have an opportunity of spinning the lucky wheel. The lucky wheel will provide you various options during the game. The maximum you can win here is hundred times the stake you put in. You will be able to get 25 free games and be able to collect huge rewards in this feature. 25 free games are awarded if you get 5 leprechaun ladies. Overall, in the Kiss Me Clover slot game, you can expect great gameplay and win great payouts. The soundtrack and graphics relate well to the theme of Kiss Me Clover.